Hey everybody this is Ayodeji Oladeji Charles, the CEO of www.naijamarketingpro.com. Naija Marketing Pro, this week, we invited Tope Aghomatse to our community where we looked at, “How to stay focused when the road seems challenging.” Tope Aghomatse, the Home Business Prof. Tope is a network marketing professional and digital entrepreneur, with about 8 years experience in the home business industry. She is a vibrant, passionate and adventurous woman who loves learning and is always excited to share what she has learnt with other people. 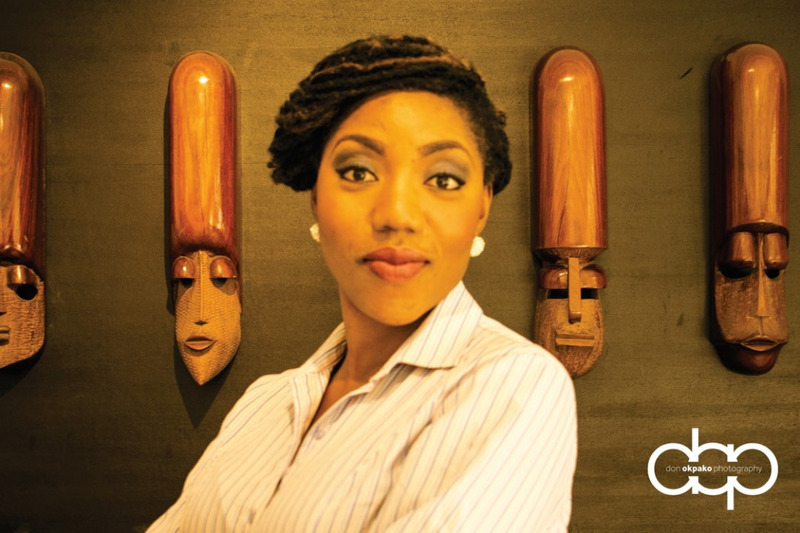 Tope graduated from the University of Ibadan (Nigeria) with a B.Sc in Zoology and has over the years gathered a couple of other degrees from the Chartered Institute of Marketing [CIM] (UK), and Shaw Academy (UK), She is also trained by the Project Management Institute [PMI] (USA), and several other reputable institutions. She is knowledgeable in several fields including marketing, advertising, brand management, direct marketing, market research, advertising, public relations, integrated media, digital marketing, social media marketing, blogging and content management, network marketing, sales and several others. She is on the quest to bridge the knowledge gap between the newbies and the top earners in the home business industry through her impactful training videos and inspirational content. On a lighter note, Tope is a singer and songwriter and she is also married with kids. Ayodeji Oladeji Charles: Good day to you Tope. How are you doing today? Tope Aghomatse: I’m doing great. Thanks for asking. Ayodeji Oladeji Charles: Thank you. Can we begin? Tope Aghomatse: You’re welcome Ayodeji. Sure, let’s begin. Ayodeji Oladeji Charles: Before we continue, let me quickly let you be aware that am currently with our media team. Ayodeji Oladeji Charles: This interview is projected basically to help give our people most especially youths the strength to keep keeping on when the road seems challenging. Over time, we observed that many people that got started in this network marketing industry, before you know it, they will go about looking for the greener pastures which to them, greener pastures is a ponzi scheme. And after testing it and landed boom and down, many of them will say network marketing doesn’t work. But I used to tell them that network marketing isn’t perfect but it is better be cause we have got a better way. Let me quickly appreciate you for the love that you have to change people’s lives if not, you won’t give us this time, out of your own busy scheduled. So, let’s start in this way. Can you tell us a little about yourself, your journey, what led you to network marketing and how has it been? Tope Aghomatse: I love the initiative of Naija Marketing Pro Community. My passion to help people succeed in networking marketing actually rests on the reality of the fact that failure rate in the industry is very high, about 90%. I realised from my own failures in my first few MLM businesses that there were millions of people like me. So, finally, when I started working on myself, I decided to lend a hand of help to millions of others out there who were clueless about how to start or run an MLM. That’s what birthed my brand, Home Business Prof. Well, I’m a marketing communications professional. Specifically, I’m the Deputy Manager of Strategy and Planning in one of Nigeria’s leading marketing communications agencies. I bumped into network marketing in 2008 when my boss then was doing it alongside his other businesses. He introduced me to an MLM opportunity but it did not make much sense to me. All I was thinking was how to focus on my job, get promoted and earn bigger salaries in the future. I was quite myopic and never really had any experience close to entrepreneurship so his talks never sank into my mind. Months later, I bumped into an aunt who was doing the exact same business and also introduced me to it. Because I really liked her, I agreed to go with her to one of their seminars and was wowed at what I saw. They showcased a lot of multimillionaires who had such beautiful and enviable lifestyles and I got really excited. My experience there hasn’t still left me till date. Of course I signed up and immediately I started the business, I felt a sudden discouragement. I suddenly realised the business was harder than I thought. I struggled for about a year and eventually gave up after facing a handful of rejections. Although I had given up on that business, one thing never left me – the thought of having a RESIDUAL INCOME. I was convinced I needed residual income if I would be rich in my life. A year ago, I was a little more determined this time, so I decided to give myself another shot. I joined another MLM and started raving about it on social media. I raised so much awareness about the business but somehow I didn’t know how to turn all that excitement into money. People just keep falling off my hand. It was really frustrating. I signed up one person before I lost interest in the business because I did not really like this company’s products (I also wrongly thought the products contributed to the rejection I was experiencing). Months after, I switched to an online referral business and my sponsor was an American. Everything about my marketing was automated. I had landing pages, autoresponders, newsletters, webforms, I even ran online campaigns but my sales remained poor. At this point I realised there was nothing wrong with my businesses, and decided to start asking the right questions – ‘What are the successful network marketers doing?’ ‘Why do these businesses have 7-figure earners and yet have so many losers?’ This was a puzzle I was determined to figure out and that was how my journey to becoming a business coach start. I started investing in my personal development. I bought books, CDs, visited YouTube everyday to watch at least one video from a top earner. I totally opened my mind and was ready to unlearn and relearn. I then joined another MLM company this February with all the knowledge in my arsenal and an unquenchable thirst for success, and my results have been very encouraging. Ayodeji Oladeji Charles: Wow. This is enlightening. 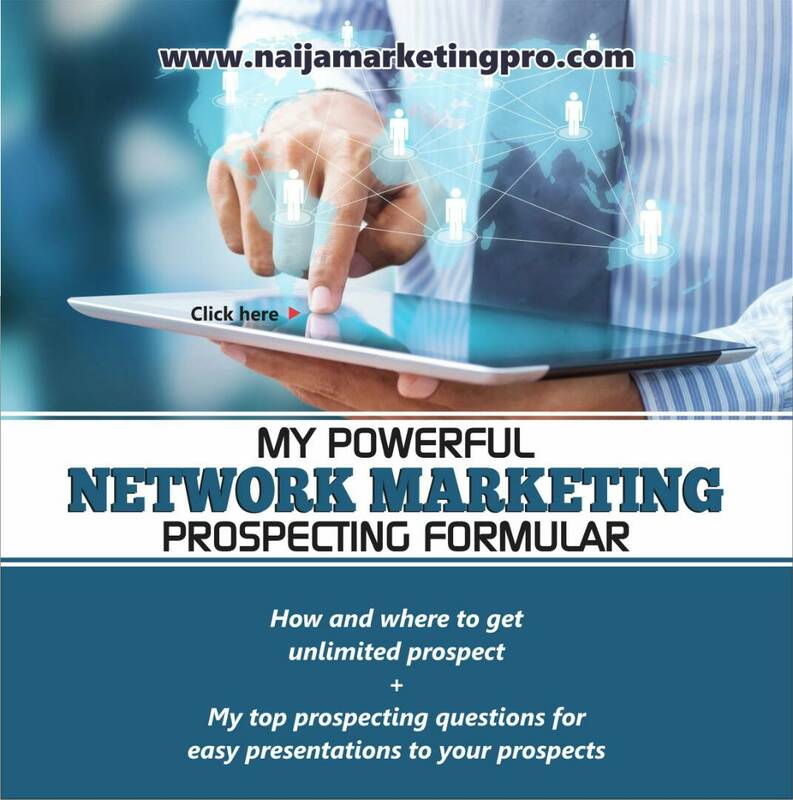 You are a network marketer per excellence, had it been there was nothing like network marketing, what is the leverage system you would have preferred? And why would you choose the one you chose? 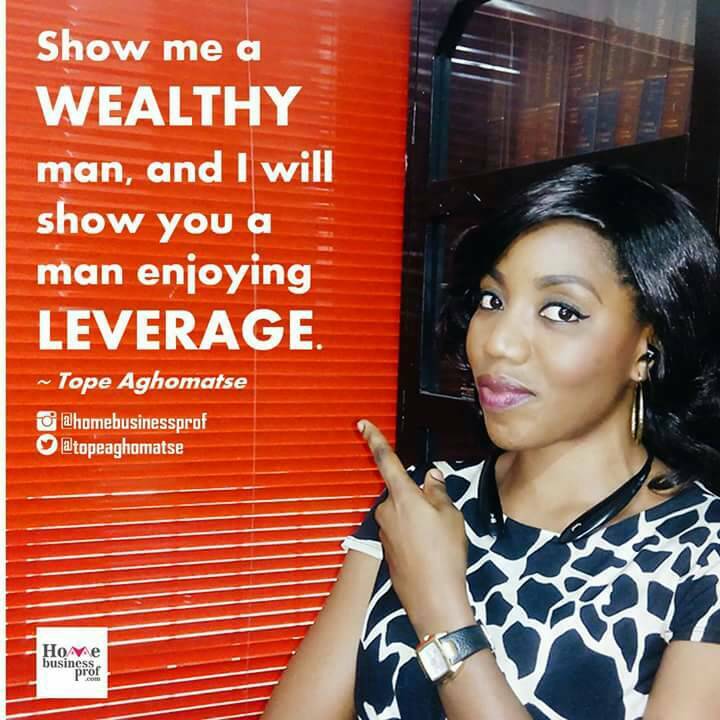 Tope Aghomatse: Honestly, speaking of leverage, I would have been a full-time investor. I love the idea of having my money work for me while I have fun doing the things I love. I also know that investing is sweet only when your invested capital is huge so I may have delved into buying and selling in order to generate the kind of money I can invest. Right now, network marketing is my money-making machine and I’ve already started investing from my earnings. Ayodeji Oladeji Charles: Awesome. Maybe I should stop calling you a network marketer or a home business prof and start calling you an investor….But, everything still centres on financial freedom lifestyle. As a home business prof, What is focus in relation to network marketing? Why should I be involved in a two network marketing company, I mean to promote two companies the same time, can we say this is a multiple income stream strategy on point? Or should I say, is it advisable to promote two different network marketing companies the same time? If no, why and if yes, why? 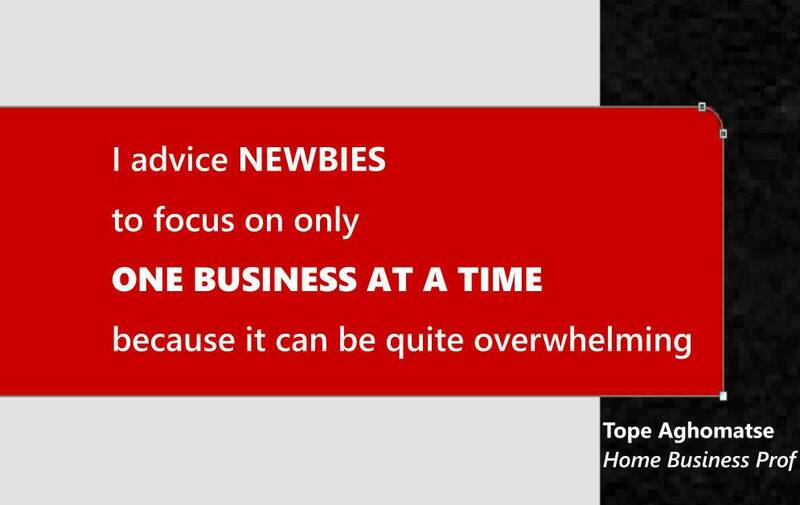 Tope Aghomatse: I advise newbies to stay focused on only one business at a time because it can be quite overwhelming. But for experienced network marketers, I think it’s OK to have more than one. I personally have 3 very different referral businesses and I signed up each one for very strategic purposes. Each time I meet a prospect I quickly profile them to know which one will suit them better, then I talk to them about it. I will show my prospects a second business opportunity only when I get an emphatic NO from the first one I showed them. Besides, one of my opportunities is very friendly for those who don’t like referral businesses because the referral part is OPTIONAL. For me, this is just being smart and maximising the people in my network. I learnt from an entrepreneurship course I attended last year that one should always have a bouquet of products or opportunities so that your prospects can have a choice. But I will add a warning here: Never show a prospect two opportunities at the same time! You will end up confusing them and also making them think you’re not sure of yourself. Ayodeji Oladeji Charles: Hmm. OK. Let’s proceed. If my upline is not supportive enough or disappeared, what is the next thing to be done by me, maybe I should disappear too? Or should I stay focused? Tope Aghomatse: The question I will ask such a person is, “If your upline dies, will you go and die too?” We all do things for different reasons so our focus must remain on our ‘WHY’. Like I said earlier, I left one of my past MLM businesses because I didn’t like the products. For me, they just weren’t ‘cool’ enough and I thought it affected my confidence. That was a very personal decision, so why should anyone just quit because I did? Truth is your success in network marketing has nothing to do with your sponsor, but everything to do with your downlines and their generation. Your teamwork in network marketing should be between you and the people following you and not between you and the people you are following. Ayodeji Oladeji Charles: ‘if your upline dies, will you go and die too’…..smiles. What is the greatest challenge that you ever faced as a network marketer and how were you able to dealt with it? Tope Aghomatse: My greatest challenge has been with keeping people in my team motivated. At some point I started feeling like I was micro-managing my team members. I got to a point I almost became a network marketing ‘Nanny’, babysitting people everyday and telling them why they should build their own business. I recently learned managing my team is not the best approach, and I should rather focus on INSPIRING them by crushing my own goals, rocking my business and living my dreams. Now I’ve stopped being that pushy leader. If people can’t really be hungry for themselves then, honestly, you can’t help them. I focus on my strong team members and I just keep going. Ayodeji Oladeji Charles: Thank you for this. What is the challenge one could face in this business opportunity called network marketing that could make him says, I will never be involved in anything called network marketing again ever in my life? 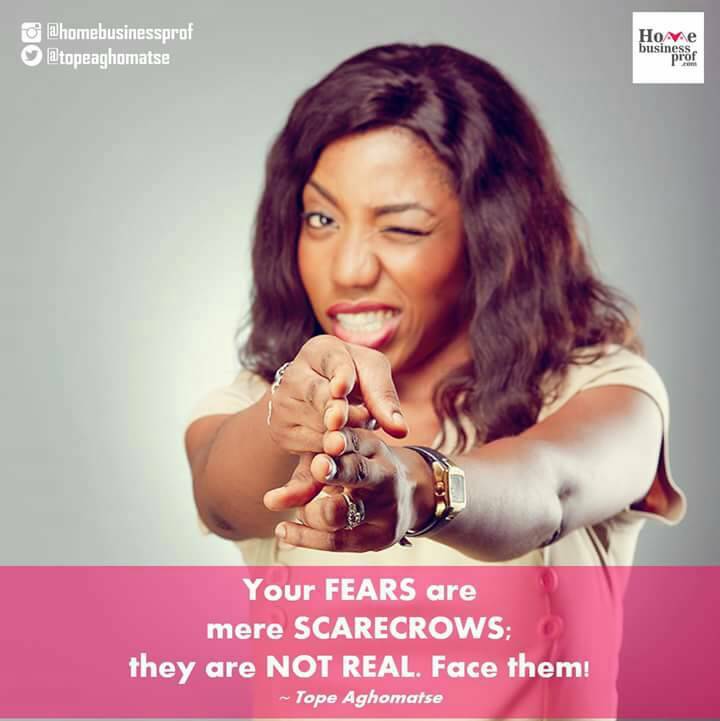 Tope Aghomatse: Network marketing is one business that can be really frustrating if you don’t know exactly what to do. It’s not like a 9-5 job where you have a job description or like a traditional business where you are just buying and selling. Network marketing is 80% mental work and 20% execution. My problem is more with the quacks out there who parade themselves as network marketers and don’t set the right expectations with their new partners. Ayodeji Oladeji Charles: Definitely. If you do nothing, you will get nothing. What could cause someone not to stay focused in network marketing? 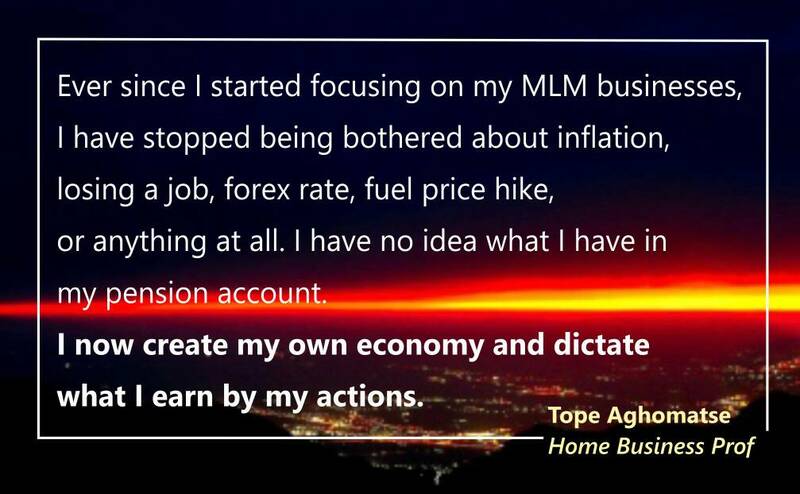 Tope Aghomatse: I have quite a handful of people in my team who are leaders and are quite influential in the other things they do, but have failed to recruit even a single person into their MLM business. This does not mean such people are unserious; it just means they are seriously doing something else where there passion lies. Such people shouldn’t have signed up in the first place because they were not ready to put in the work. It’s not enough to fancy the idea of earning residual income, you must have a burning desire to make it happen for you. 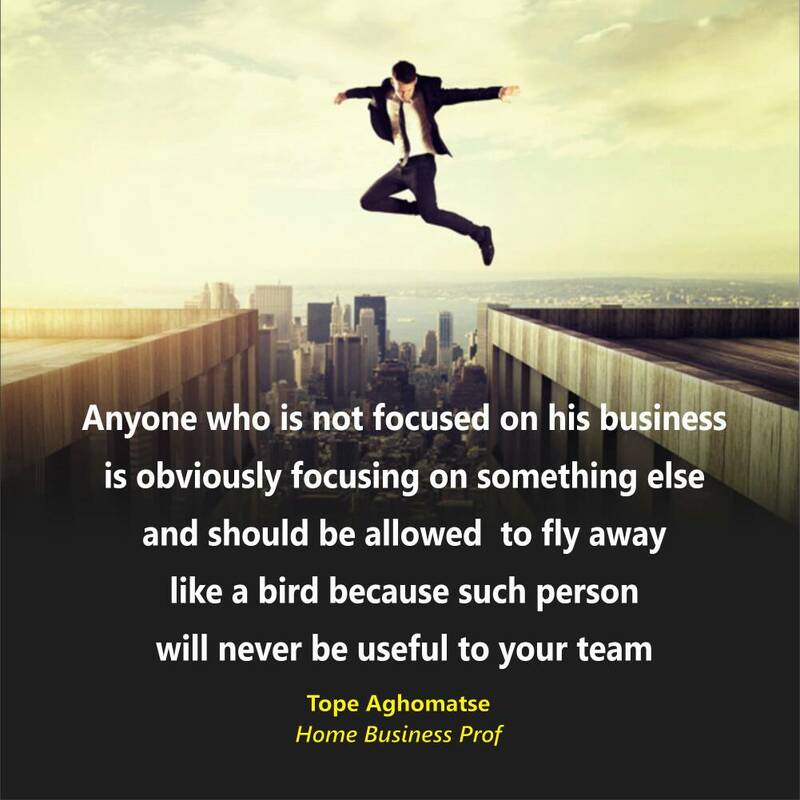 Anyone who will not stay focused on his business is obviously focusing on something else and should be allowed to fly away like a bird because such person will never be useful to your team. This brings me to this important point: MLM recruiting is a skill that has to be learned. Not everybody that has money is ready to be a network marketer. People should stop cajoling others to sign up if they really don’t want to. There are thousands of others out there hungry for the same opportunity. Ayodeji Oladeji Charles: Hmmmm. How can I stay focused when it seems nothing is even working out for me again? Tope Aghomatse: You don’t wait for your business to work out; you should work it out yourself. That your income will be passive does not mean your work will also be passive. If anyone feels disoriented in his own business, it is because he or she has failed to create his or her desired results. I follow at least 8 network marketing leaders on Facebook and on YouTube and I visit their pages everyday to learn, that is why my results are getting better. Success does not happen by chance; you have to work it out. Ayodeji Oladeji Charles: Wow. If every youths can be like you, I don’t think there will be anything called unemployment in Nigeria. How do you think network marketing is the solution to youth unemployment in Nigeria? 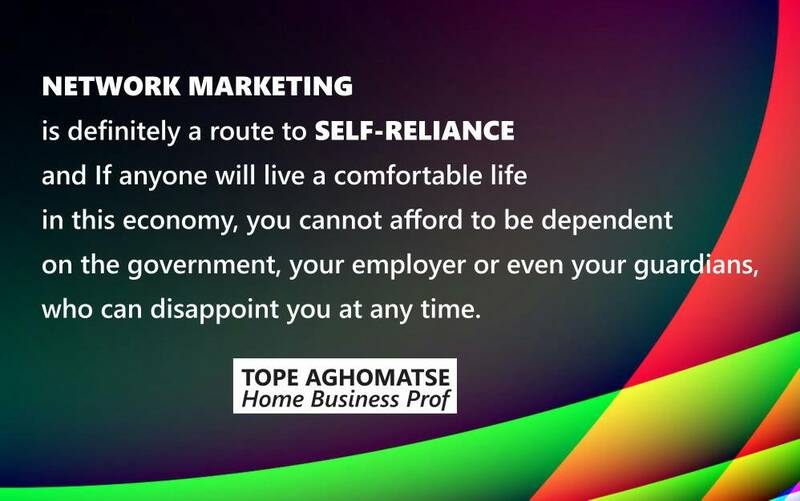 Tope Aghomatse: Network marketing is definitely a route to self-reliance and if anyone will live a comfortable life in this economy, you cannot afford to be too dependent on the government, your employer or even your guardians, who can disappoint you at any time. Ever since I started focusing on my MLM businesses, I have stopped being bothered about inflation, losing a job, forex rates, fuel price hike, or anything at all. I have no idea what I have in my pension account (Lol). I now create my own economy and dictate what I earn by my actions. Every youth, and adult alike, should start thinking of taking their lives in their hands and determining what they get out of it. Ayodeji Oladeji Charles: Definitely, it’s actually possible to take full ownership of your own life. I am afraid that this business may not work for me, please what should I do? 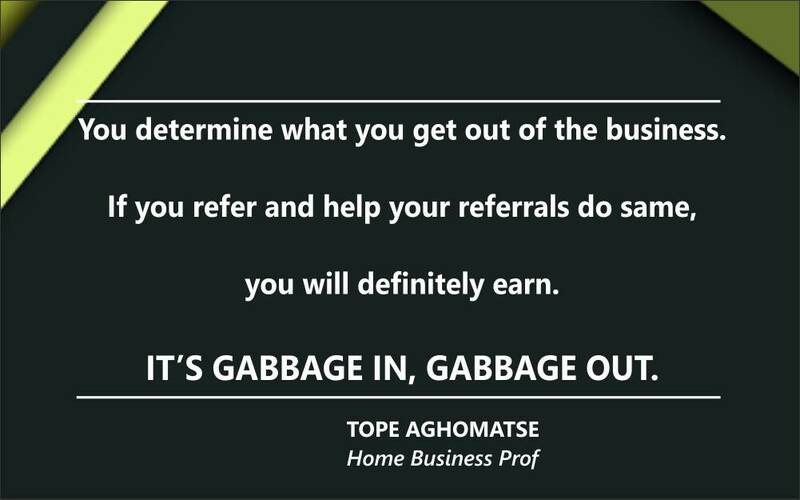 Tope Aghomatse: You determine what you get out of the business. If you refer and help your referrals do same, you will definitely earn. IT’S GABBAGE IN, GABBAGE OUT. So if you’re afraid the business may not work, then it means you’re afraid of yourself. And the No. 1 reason behind the high failure rate in MLM is people already get defeated in their minds before even meeting their prospects. If you are defeated in your mind, you will surely be defeated in reality. I have also noticed that a lot of people are too impatient to build their business. You can’t microwave success; there is a process to getting there and it takes planning, execution, consistence and patience. Ayodeji Oladeji Charles: ‘Gabbage in gabbage out. It is what you put in that you get.’ This is interesting. So many people have bastardized network marketing to ponzi scheme, what advice would you like to give to someone thinking about getting involved in a network marketing? 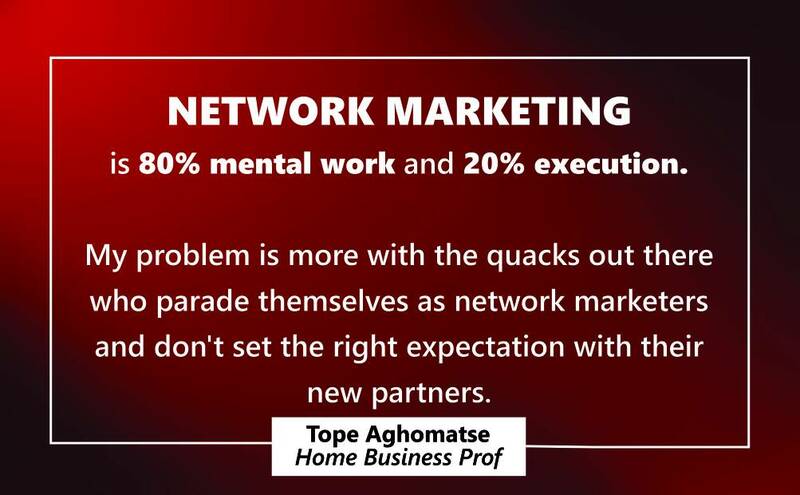 Tope Aghomatse: Network marketing is not a hobby, it’s serious business and I expect that anyone joining any MLM should take his or her time to check it out. People could be afraid simply because they don’t know the difference so I try to educate them on the differences. If they are still not convinced I just leave them and keep moving. I cannot work with a person who thinks I could be associated with fraudsters. You may meet people who have no intentions of signing up and just want to harass or intimidate you, so you have to know when to close such conversation and walk away. Ayodeji Oladeji Charles: That’s true. If I may ask, as a mother, business woman and a trainer, how do you balance your time with your home and work? Tope Aghomatse: Wow! I must confess it has been quite challenging trying to strike a balance, especially with my very demanding full-time job. I try to work with a routine though. I don’t create a special time for prospecting. I’m very aware of the people around me and I network on purpose – round the clock. I work on my blog mostly at night because I work during the day. I also restrict my trainings to weekends for now. To keep tab on my appointments and follow-ups, I use my organizer, alarm clock, calendar, etc. I plan to let go of my 9-5 job very soon so I can spend more quality time building my business. Ayodeji Oladeji Charles: In fact, I see you quitting the job soon and recruit your boss……smiles. What do you do after work? Tope Aghomatse: Lol. To be honest with you, I really don’t have any fun time yet because I literally work round the clock. I have so much backlog of work on business that I grab my laptop at the very slightest opportunity, just to clear some piled up work. For now, my business is my getaway because I have a lot of fun doing what I do. Hopefully soon, I can add travelling, song-writing (I’m a musician by the way), watching movies and a lot of sleep. Ayodeji Oladeji Charles: I see you getting there soon. Ayodeji Oladeji Charles: I can understand what’s like to be starting a company from the scratch and to be a mother and other responsibilities. What encouragement/words do you have for Naija Marketing Pro Community? To add, To be a leader, you have to be ready to sacrifice your time, energy and resources to serve humanity. And to learn, you have to sacrifice time, energy and resources. We have both in network marketing! Leaders that can’t sacrifice don’t deserve to be leaders. Both leaders and followers are learning and so both make sacrifices too. Do you want to get to the top? Then learn to sacrifice your time, energy and resources. Losing your focus is not the best thing to do in terms of challenges. Tope Aghomatse: To all the members of the Naija Marketing Pro community, I say big congratulations on deciding to take charge of your lives. Stay focused, keep crushing your goals, keep rocking your business and you will one day see your dreams come true. I love you all, and I’ll see you at the top! Ayodeji Oladeji Charles: Thank you Home Business Prof. All of us at Naija Marketing Pro Community says that we love you, we appreciate you and we say, that we will surely meet at the top. Tope Aghomatse: You’re welcome! My regards to your team players. Ayodeji Oladeji Charles: Interesting isn’t it? I hope you won’t lose the focus when the road seems challenging instead, you will do more by becoming a better person for the task. It’s our wish to see you becoming a Naija Marketing Pro. because with network marketing, you can take full ownership of your life. Our social media creative director is working on more of our social visibility. For now, follow our blog posts.Thank you. How nice to read this educative and inspiring interview. Tope was my room-mate back in U.I. I’m proud of you girl. The sky is your starting point. I salute the Naija Marketing Pro team as well..
Good work ,good content, good result.